Brave the Bumpty Blizzard is the first level of World 5 found in Yoshi's New Island. 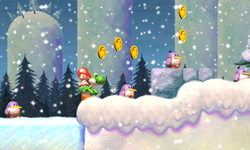 Yoshi starts the level in a snowy area with enemies and ice blocks with the Checkpoint Ring nearby. Eventually, Yoshi reaches a Whirly Gate which transforms him into Bobsled Yoshi, which he must use to clear the obstacle course and appear at a cave with a Checkpoint Ring. After bouncing across some Bumpty groups, Yoshi reaches the Goal Ring. This page was last edited on April 15, 2019, at 12:10.